I fell in love with yak blankets and throws and we now carry them at Anichini. They are 100% natural and reflect the dark brown color of the yak. They have a very soft hand, close to cashmere, but the blankets are more durable. Like the cashmere of goats, yak hair is a secondary fiber (called down) grown each winter and shed in the spring. The nomads collect the fiber when the yaks molt either with combs or just pulling it out by hand. It is also collected off the hides of butchered animals in the fall. The down fiber then works its way to spinners via traders buying from the herders, selling to consolidators who sell to de-hairing factories and then it’s bought by either spinners or end users who have it spun. 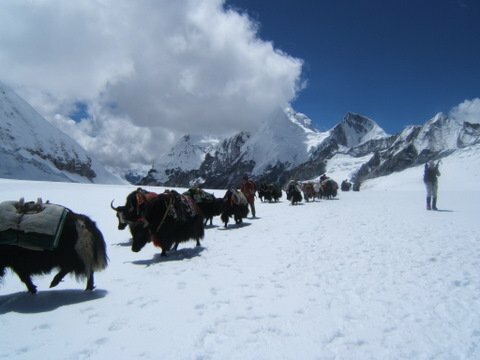 Yaks require more forage than goats and sheep so the larger herds are seen more to the north and east in Amdo and Kham of Tibet (Qinghai and Sichuan today). The grasslands there are more lush than in Central and Western Tibet where goats and sheep predominate. To lessen chance of calamity, traditional herders keep a mixture of animals – goats, sheep, and yak. Yak give the best meat and milk and the coarse outer fiber (guard hair) is used for tent fabric, ropes etc. The best quality yak hair comes from Outer Mongolia followed by Amdo and Kham. There are also herds in Inner Mongolia. There are wild Yak in remote areas of Tibet, these are an endangered species and trade is prohibited. All the yak hair in the market is from domestic animals.